The Regional East African Health Research agenda was presented as a keynote speech during the first East African Health and Scientific Conference, held in Kampala, Uganda from 28th to 30th March 2007. The agenda was developed through a critical analysis of the global, African and Regional East African health challenges and mitigating strategies, taking into account the Millennium Development Goals (MDG), the Abuja declaration and the New Partnership for African Development as background environment, within which the Agenda will operate. 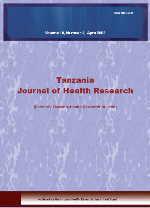 It is proposed to: establish a joint mechanism for research coordination, promotion and regulation; establish stronger collaborative mechanisms for research and training; create a joint Regional East African Community health research and development fund; create joint intellectual property rights protection mechanism, enhance patenting and link research to industry; create a mechanism to enhance translation of research to policy and practice; strengthen clinical research capacities; and strengthen innovation and discovery research capacities. Effective implementation of this agenda will greatly raise the profile and quality of research in the region and improve the health status of the East African populations.